Doi Suthep-Pui National Park, the superb landscaped national park covers an area of 262 square kilometres of Amphoe Mae Rim, Amphoe Hang Dong, and Amphoe Mueang Chiang Mai. The park consists of verdant forests and mountain ranges. Major mountains include Doi Suthep, Doi Buak Ha, and Doi Pui. Huai Kaeo Waterfall is located 6 kilometres from Chiang Mai town. The 10-metre cascade provides a delightful ambiance of scenic views and various plants. 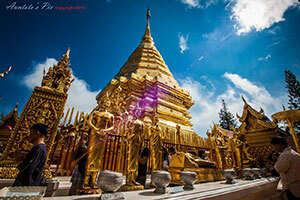 Khru Ba Siwichai Monument is situated at the foot of Doi Suthep Mountain. The monument honours the devoted Buddhist monk whose followers built the first 10 kilometre road to Wat Phra That Doi Suthep in 1935.